Pattern made with the new 45 wheel. The people at Kahootz Toys, the company that’s bringing back Spirograph, found my website. Guess it was just a matter of time. 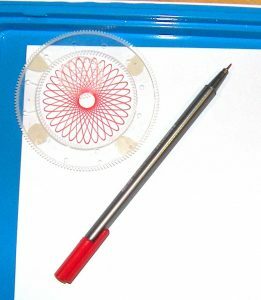 Anyway, they – well, a friendly person named Colleen, actually – noticed what I said about my wheel 45 in my new Spirograph Deluxe Design Kit – its Hole #1 is so close to the edge that it isn’t round, and can’t be used. She sent me a new one in the mail! She also thanked me for my feedback generally, and said that they are interested in what customers have to say. So here’s a link to their Facebook page. Please give them a Like and enjoy their posts and ideas of things to do with Spirograph. And here’s a link to my Facebook page. Please give it a Like too! There’s lots more Spirograph goodness coming right here. 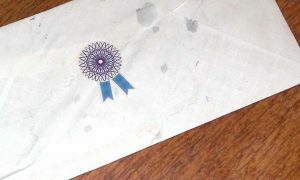 And oh yes – check out the sticker on the back of the envelope I got from Kahootz. Nice, eh? I wonder where to get some of those! Thanks for your message. You’ll probably find that 4 1/2 is a little young unless she is remarkably dexterous. It’s easy enough to share a set too, until someone gets passionate about it. There are versions designed for younger kids. You may want to try Cyclex, which I haven’t tried or reviewed. Fewer small parts that could get lost. Maybe one of those plus a regular set.